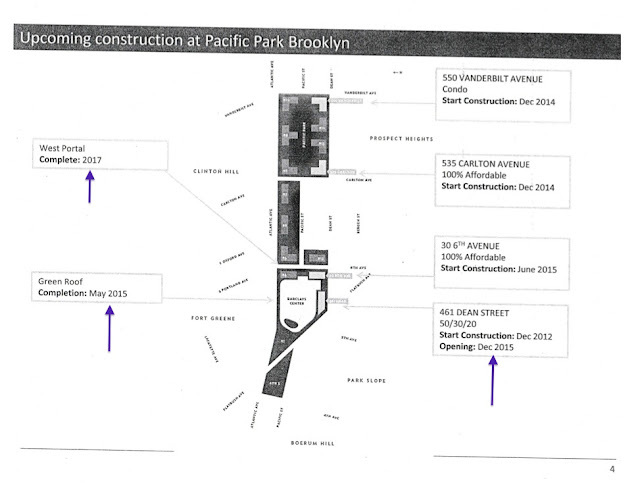 They didn’t tell us that Atlantic Avenue would be constricted a lot longer than they announced in June 2014. 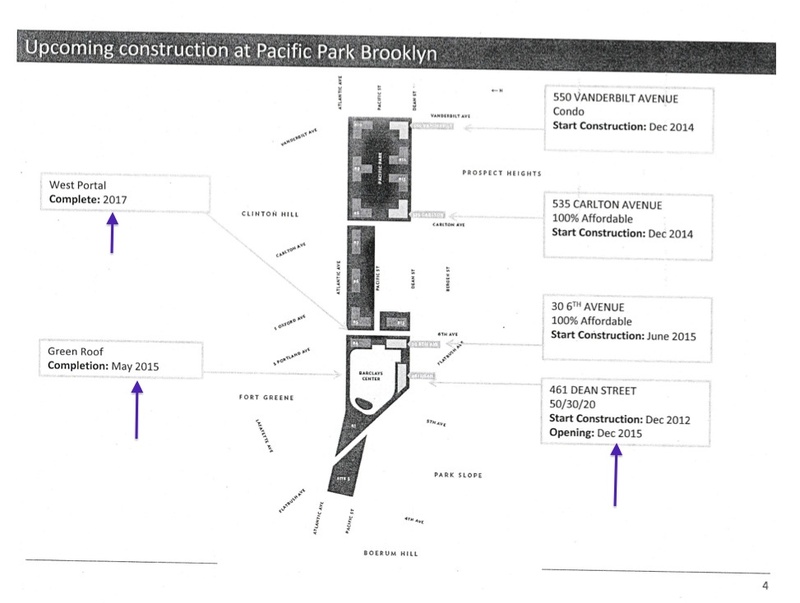 In fact, the developers of Atlantic Yards/Pacific Park misled us for a year, and last week provided an explanation I find quite dubious. 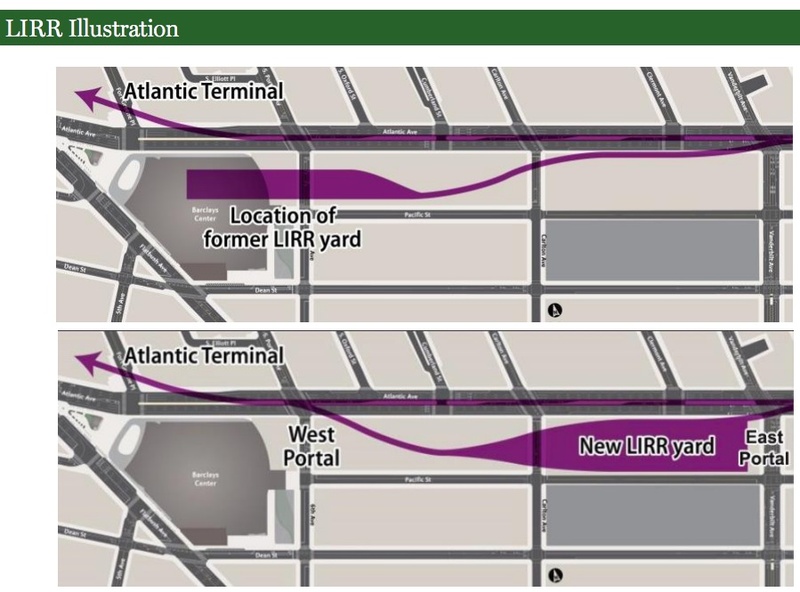 More than a year ago, officials at Greenland Forest City Ratner changed the timeline for work on the Vanderbilt Yard, guaranteeing an extension of barriers and constricted traffic on Atlantic Avenue. 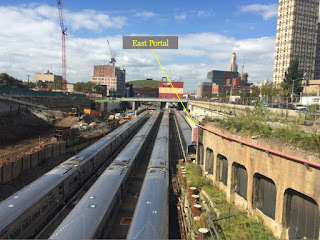 They shifted the date for completing the West Portal—a connection from the railyard to Atlantic Terminal that requires work under Atlantic Avenue near Sixth Avenue outside the Barclays Center—from early 2016 to late 2017. They just forgot to tell the public, the press, and the Community Boards. They did, apparently, tell some elected officials of their new plan, but they did so in such an oblique way none of the officials shared the information or even recognized it was news. Cotton pledged to discuss the issue at a future meeting and did so at the barely-attended Oct. 14 Community Update meeting. “Let's just think about it,” Cotton said. “We're going to finish West Portal railyard work [a newly configured yard to store and service LIRR trains], the East Portal… then we're building a platform, then we’re building buildings." 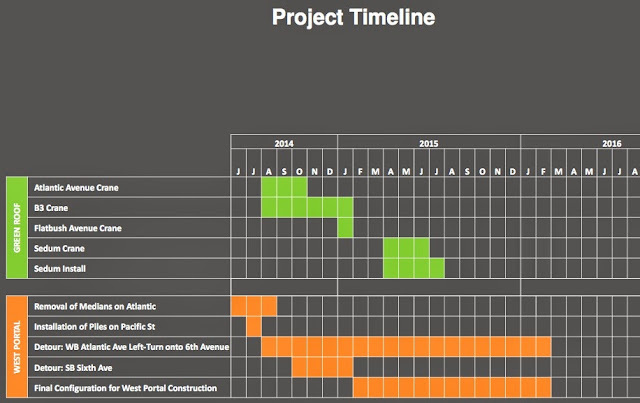 In other words, they should have told us not only that Atlantic Avenue would be constricted not only for West Portal work—the timeline of which has now been extended—but for the next decade. In other words, the switcheroo practiced last year preceded the energetic campaign to bring the DNC to Brooklyn. That means the developer knew what a mess a main artery around the arena would be at the time of the convention but did not say so. Cotton noted that last month people pointed to a change in completion date for the West Portal from what was stated in a presentation released 6/2/14. Cotton noted that Greenland Forest City had not made a “big announcement” last month, because it didn’t think it had real news to share. I'm not convinced. How could Forest City and Greenland, after June 2014, somehow come up with a new plan? 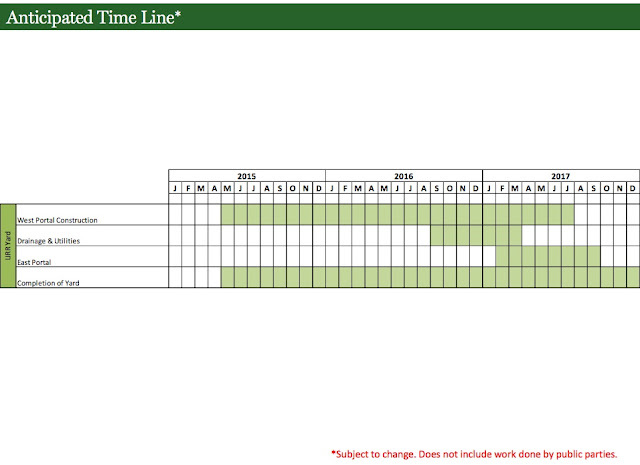 After all, Forest City in April proposed a new December 2017 timetable for the railyard. Bizarrely enough, by the way, none of this was subject to review in the court-ordered Supplemental Environmental Impact Statement completed last year, because the railyard work was considered part of Phase 1 of the project, not Phase 2. Cotton described three pieces of work: the West Portal, railyard work, and the East Portal. 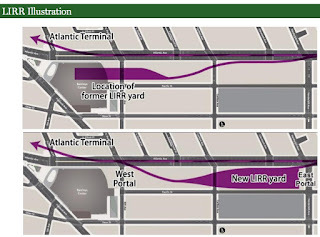 The West Portal will provide an advantageous direct connection to the railyard, as opposed to the current East Portal, in which trains must go east of Vanderbilt Avenue and then reverse course back to the passenger terminal. Because of the big cement structure that is the East Portal, the track behind it can only hold a 6-car train, while the other six storage tracks can hold an 8-car train. “In order to extend the track to have an 8-car train, we will modify the East Portal,” Cotton said, which requires removing the wall and moving the tracks. That will make a 56-car railyard. That’s very interesting, because East Portal work was not contemplated—at least in public documents—when the replacement railyard was supposed to have 9 tracks with capacity for 76 cars, rather than the smaller railyard Forest City renegotiated in 2009. Could it be that the smaller railyard requires work that was not even anticipated in the larger one? When did they tell the politicians? I got a copy of a document shared with elected officials. There’s no explicit statement about a change in plans, but one page does say 2017—not July 2017—regarding the railyard. The document also states that the green roof would be completed by May 2015 (it's not done yet) and the B2 modular tower would be finished by December 2015 (it could take a year longer). In other words, all dates are subject to change. At the meeting, I asked Cotton whether they could provide more detail on the work, how it’s expanded and the timetable. She said no. I later sent an email asking which elected officials were told, and when. I didn't get an answer.